It’s Spring! No, really. The Spring equinox was at 11:01:53 on Wednesday 20th March 2013. Which happens to coincide with the Persian New Year (Nowrooz). So we wish you all a happy and prosperous 1392. 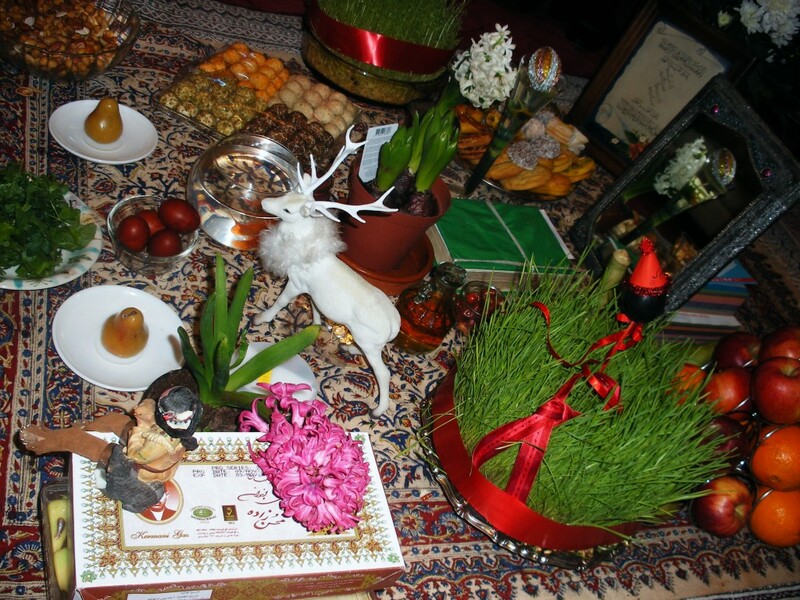 Iranian celebrations to welcome in the new year/spring go back millennia, to ancient Zoroastrian times and beyond, and there is a lot of symbolism attached. Every house lays out a ‘sofreh’ like the one in the picture: on it they will place candles and a mirror for light, goldfish for prosperity, and seven things beginning with the letter ‘s’ (in Farsi of course), which are known as the haftsin. This comprises sabzeh (wheatgrass) and samenou (wheatgrass mousse) and sombol (hyacinth) and sumak and sekeh (coins) and sib (apple) and senjed (wild Russian olives) and serkeh (vinegar), and esphand (wild rue). Oh, and lots of sweets: you are meant to start the new year as you mean to go on, and sweetness is a must. The white stag and Hiawatha seemed to have strayed into the picture from a different celebration (i.e. I’ve no idea what they’re doing there). The food eaten at this time is also very traditional, involving lots of herbs and plenty of spring garlic. Sabzi pulao is one such dish (recipe coincidentally in Veggiestan…): herbed garlicky rice served with meat or vegetable stock (or smoked fish). The recipe below is kind of a cross between sabzi pulao and potatoes Lyonnaise; the result a slightly-naughty-but-intriguing side dish or snack. Cut the pots into thickish slices, blanch them in boiling water for around three minutes and then drain them. Next heat the oil in a frying pan and add the butter. Fry the onions until they are starting to brown before adding the saffron water and spring garlic. Cook for a couple of minutes more before taking off the heat. Layer one third of the potatoes in a greased over tray, cover with half of the onion mix and sprinkle with half of the chopped herbs and a little salt and pepper. Repeat with the second third of the spuds and the remainder of the onions and herbs. Top with the rest of the potatoes and bake at gas mark 6 (200C) for around forty minutes or until the potatoes are crispy golden. Enjoy. This entry was posted in Recipes and tagged dill, Iranian New Year, Nowrooz, potato, sib zamini lyonnaise, spring garlic. Bookmark the permalink. One Response to Nowrooz Potato Lyonnaise. Just for Fun. When you say ‘spring garlic’ do you mean wild garlic leaves? If not, what is ‘spring garlic’?